Some of the special features of this trainer are the overload, single phase, and short circuit protection. 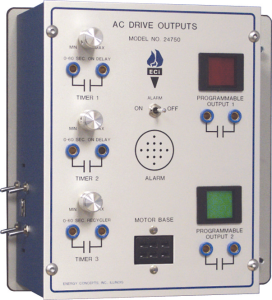 The Drive Fault Interruption functions provide for student safety and drive integrity. Cables and connectors are safe and easy to use. All of the modules are housed in a durable steel enclosure for years of classroom life. 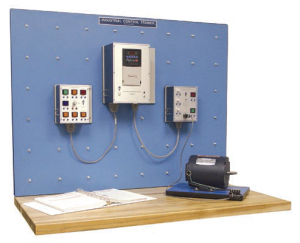 This trainer is designed with modular components that mount on the training panel for easy use. 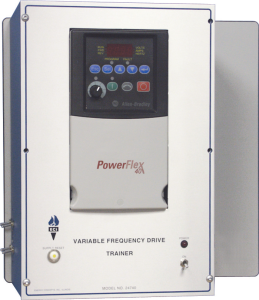 You can interface the Variable Frequency Drive System with other Training Systems from Energy Concepts such as our Industrial Controls and our Programmable Controller Trainers. 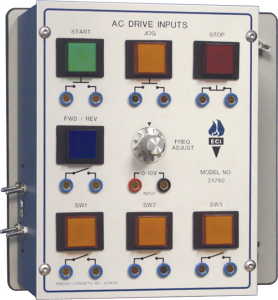 ECI’s competency-based courseware guides students through the Variable Frequency Drive experiments.Troubleshooting experiments are provided for students to develop practical skills and troubleshooting techniques. The ECI lab manual has an easy-to-read, two-color format, that shows professional illustrations, charts, tables and photos. The lab manual’s 10 chapters present students with 30 hands-on lessons, which directly correlate to the ECI 247 trainers. Integral keypad with a 4 LED digital display and 10 additional discrete LED indicators provide intuitive control. Most commonly used parameters are grouped together for fast and easy start up. 120VAC Single Phase Input, 230VAC Three-Phase Output. Analog and Digital Speed Control. Seven industrial standard, illuminated pushbuttons for external control functions. Seven clearly marked dual input jacks for accepting an external switch closure or interfacing with the output module. Electrically isolated input jacks for Drive protection. 0-10 Volt Speed Control Input Capability. Audio alarm for drive fault recognition. Two on delay timers and one recycler timer have variable time settings from 0 to 60 seconds. Three sets of clearly marked timer output jacks provide switch closure or feedback to the AC Drive Inputs Module. Two Programmable Outputs have industrial standard indicator lights. Two clearly marked dual output jacks provide switch closure or feedback to the AC Drive Input Module.